On Tuesday night, Chair Francis Campbell’s ANC6B Planning and Zoning Committee voted unanimously to forward recommendations on the Hine Development to the full ANC6B without recommendation. 3) A “fairly harsh” DDOT report recommending less parking for the project, rejecting the developer’s plan for unloading 55 trucks on 7th Street, and raising concerns about parking for affordable housing residents of the project’s North Building. 4) The Construction Management Plan, which has not yet been submitted to the developer and which has yet to be subject to negotiation and discussion. Hine Subcommittee Vice Chair Brian Pate pointed out that reducing the parking in accordance with DDOT recommendations would jeopardize the 50 half-cost parking spaces the developer will make available to flea market vendors on weekends. One of the major community issues, adequate space for the weekend flea markets, appears to be on its way to resolution. Commissioner Pate referred to a weekend market tent plan drawn up to Oheme Van Sweden Landscape Architects which would accommodate 250 tents, more than currently comprise the combined total of the weekend flea markets on the Hine site and the vendors on the plazas and sidewalks around Eastern Market. 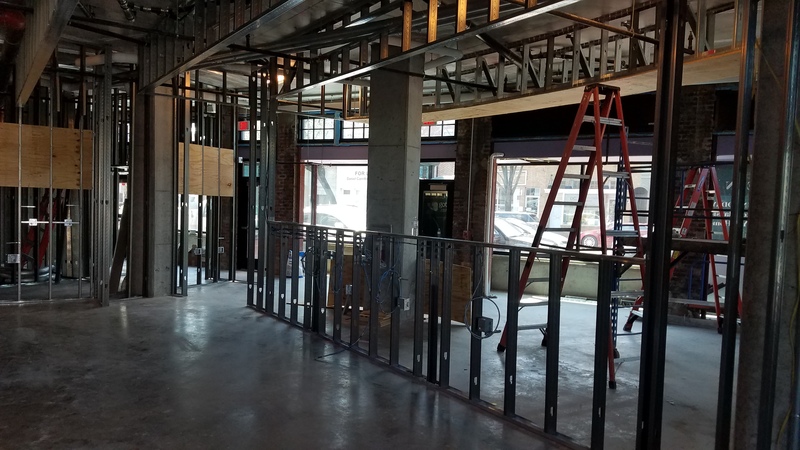 Logistical issues and accommodating the concerns of the “brick and mortar” 7th Street merchants need yet to be worked out, but Pate was confident they could be. ANC6B, at a Special Call meeting which immediately preceded the Planning and Zoning Committee meeting, agreed to a resolution of support for Councilmember Tommy Wells’ Eastern Market legislation, which addressed several other flea market concerns raised by residents, vendors and the two weekend flea market managers. Today, EMMCA President Barbara Riehle sent the following letter to the staff of the Historic Preservation Office, which participates in the review of the historic preservation application for the Hine Development. The staff will write a report to the Historic Preservation Review Board (HPRB) on the remaining buildings for consideration. While HPRB had originally set July 28 to hear from the developers and the community regarding the design of the 7th Street residential building and the C Street residential building, the date for the hearing has been moved to the 4th of August. Stanton-Eastbanc will deliver their latest drawings to the Historic Preservation Office (HPO) as previously scheduled, Thursday, July 21. The plans go to the HPRB on Friday and will be posted on the Stanton-Eastbanc website, Hineschool.com. The ANC has scheduled a special call meeting for Tuesday, July 26, to hear a presentation from the developers on the two buildings remaining for consideration, hear from the community, and formulate a response to the designs for submission to HPO on Wednesday, July 27. On July 29, the HPO staff will file its report on the buildings with HPRB. Although the hearing has been pushed back a week, the remaining aspects of the schedule have not changed, so the community will have a very limited window in which to deliver a response to HPO. To ensure that written comments will be seen by HPRB members, those comments must be filed by July 27. Members of the community may appear in person during the public hearing on August 4 to make a presentation without filing an advance copy of the remarks. 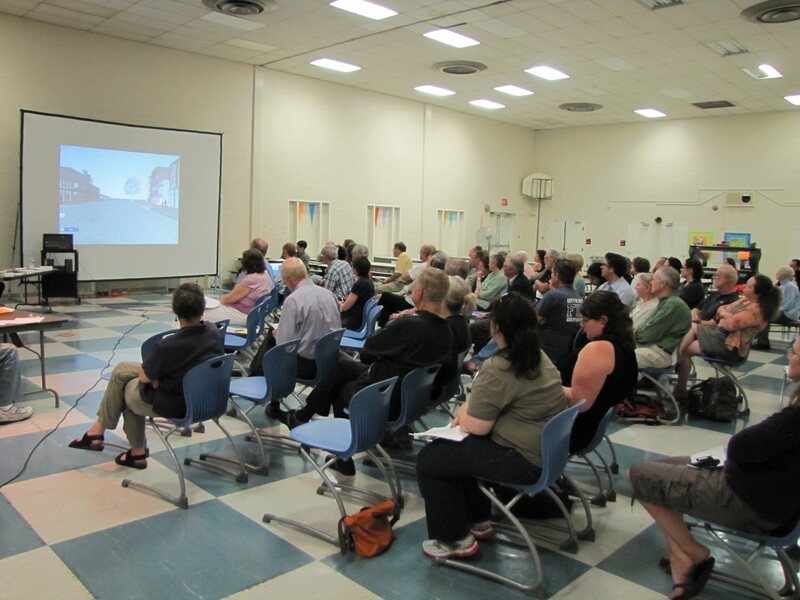 At the HPRB hearing on June 30, a number of supporters of the Hine project joined EMMCA and other local groups to offer testimony on the project. For the most part, supporters of the project offered testimony on their perception of how the project would benefit the community rather than on the historic preservation aspect of the project. To that extent, the testimony of these advocates appeared more orchestrated than spontaneous to some observers. The timeline for the Historic Preservation Review Board’s (HPRB) and ANC6B’s consideration of the remaining aspects of the Hine project is deeply troubling. As you know, EMMCA – Eastern Market Metro Community Association – represents more than 100 households in the neighborhood surrounding the Hine site. Ensuring that each of EMMCA’s members has an opportunity to shape EMMCA’s position on issues is an integral part of our organization, and, I believe, sets us apart from groups whose decision-making rests with a select few. Until now, the Hine developers have been accommodating to neighbors and interested parties in terms of making plans accessible in a timely manner. Regrettably, the current timeline – even with a one week delay by HPRB – is insufficient to permit informed community input. Much was made, in testimony before HPRB last month by individuals testifying in favor of the current designs, about not delaying this project any more than it already has been. It is important to clarify that no delays to the project have come from community members. In fact, the only delays that have occurred were sought by the developers and granted by the City. Permitting adequate time for the community to review and comment on the plans, which will alter permanently the character of the neighborhood, assures the integrity of the process. The next phase of the Hine project is the Planned Unit Development (PUD) process. No schedule or notice for the PUD process has been provided yet, and there is no reason to believe that providing additional time now for community review will have any impact on that next phase. HPRB met on Thursday to review Stanton Eastbanc’s Hine project and – while approving the basic site plan and the general architectural direction of the project – deferred consideration of the all-important height and massing issues until next month. Chair Catherine Buell noted these issues are complex and will be addressed building by building. More than a dozen residents – some representing community groups and some representing themselves – testified against aspects of the Hine project. 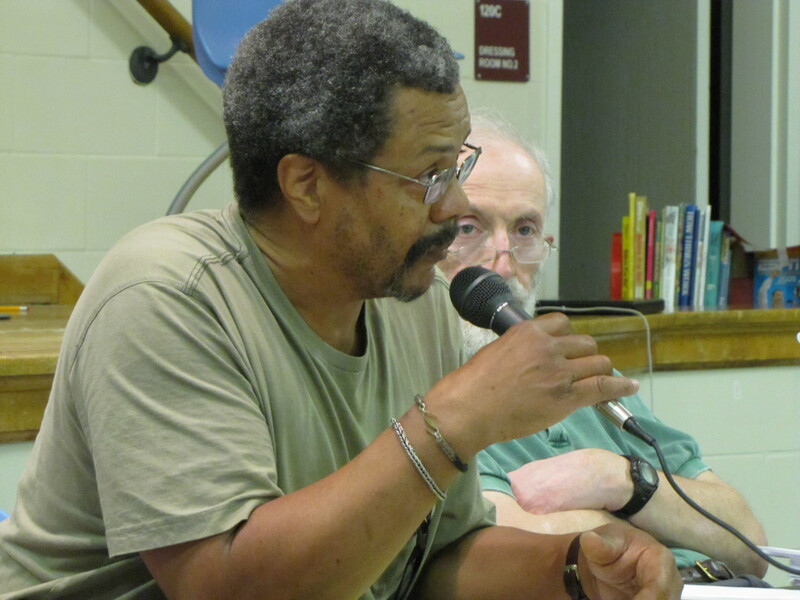 The two community organizations which appeared to have the most sway with the Board were ANC6B, represented by ANC Vice Chair Ivan Frishberg, and the Capitol Hill Restoration Society, represented by Shauna Holmes. Each raised similar objections regarding height and historic compatibility, particularly with the two buildings fronting on Pennsylvania Avenue and D Street. These objections were in opposition to the staff report of Historic Preservation Office, which looked more kindly on the two buildings. 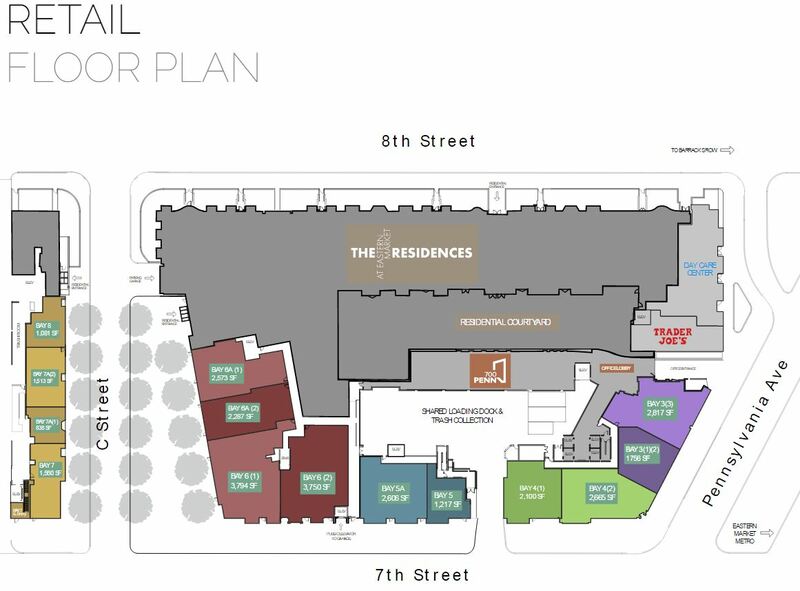 Regarding the 7th and Pennsylvania building, Holmes said, “exclamation points are fine – shouting with exclamation points is not.” She went on to urge reconsideration of the 8th and D building as failing to convey anything other than associations withSouthwest DC. Holmes also urged HPRB to convene a group meeting of major stakeholders including DDOT, Office of Planning, ANC6B, EMCAC, Market Row,Barracks Row Main Street, andCHRSto provide project input and insure that the proposal is the best that can be done. Other community organizations testifying included EMMCA, Eyes on Hine, and the 200 block of 8th Street Coalition. All raised concerns with the project’s height and massing. Steve Callcott, representing the Historic Preservation Office (HPO), appeared to have become more critical of the project than the HPO staff report published last week indicated. In his remarks to the Board, he said he was unconvinced that the design of the north residential building was appropriate for the location. He said he was comfortable with the architectural direction of the 8th Street residential building, suggesting only a variation in the building’s roofline. However, Callcott went beyond the staff report on the 8th and D Street Building, saying now that it is “very important to address the architectural direction of the building to make sure it was headed in the right direction.” He noted that HPO had been more optimistic about the building in its report but recognized that there were clearly concerns about the height and architecture. While recognizing the call of the ANC and CHRS for reduction in height of the 7th Street and Pennsylvania Avenue office building, he said he stood by the HPO assessment that a taller building in this location is compatible with the character of the Historic District. He said that a softer resolution of the issue of the appearance of the building’s height involving recessing the top floors of the building could be achieved. Finally, he noted that the architectural direction for the 7th Street office building and the 7th Street residential building have “not been accomplished” and the buildings “have not achieved a sense of place yet,” and would receive further review. He concluded that he thought the project was largely supportable but the reality is that it still needs a lot of work. Chair Catherine Buell noted that the majority of comments and concerns raised by community groups and members could be addressed by staff as they work with the architect in light of the views of ANC6b and the CHRS. The vote to approve the basic site plan and the architectural direction was 5-0 with Chair Catherine Buell, Maria Casarella, Pamela Scott, Joseph Taylor, and Christopher Landis voting to approve. Board Member Tersh Boasberg has recused himself from this case. Members of the community who had testified seemed pleased that their comments appeared to be taken seriously by the Board. 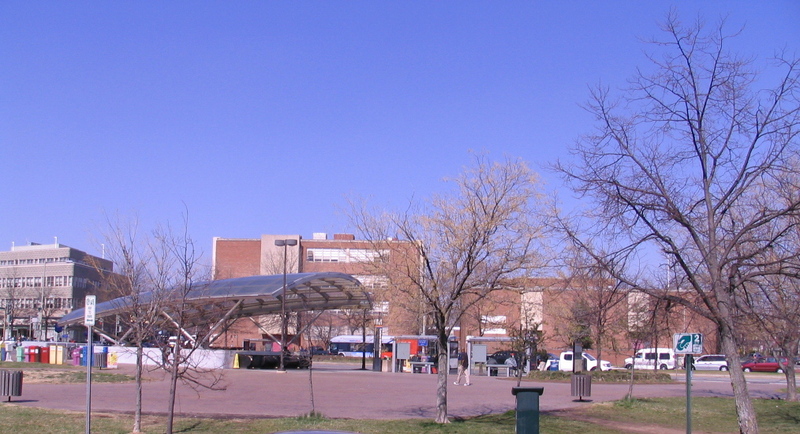 One commenter characterized the feeling as “cautiously optimistic” that the effort would result in positive changes from the community’s point of view. The concept drawings will undergo revision in the weeks ahead, and these revisions will be considered by the Board in a May meeting to address the project’s height and massing issues. That will likely be followed by another hearing – probably in June – to review all the changes to date in the project. Following that meeting, if the Board signs off on the project, the developer can file for Planned Unit Development status and the project will go before the Zoning Commission. Community members and community organizations will have another opportunity to effect changes on the project and everything will be on the table – not only design elements, but usage issues. That process is not likely to begin until early next year. 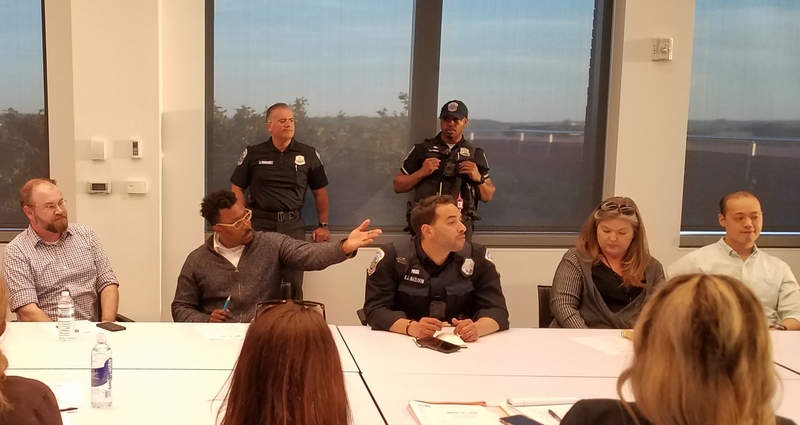 Tuesday night’s ANC6B Special Call meeting on the Hine project started at6:30 p.m.with more than 50 Capitol Hill residents, but there weren’t many of them left four hours later at meeting’s end. The ANC hammered out a resolution of recommendations on the Hine project which it will present in testimony before the Historic Preservation Review Board which meets today (Thursday) at 2:15 p.m. to review the historical preservation aspects of the project. The resolution recommends the developer reduce the height of the 8th Street residential building, a goal long sought by the nearby residents. In addition, the measure emphasizes that the ANC supports reserving the large interior courtyard as public space, and states that if the developer sticks with the current plan of keeping it private, it should shrink in size and be used to reduce the height and mass of the building. The resolution expresses the ANC’s vague discomfort with the height, scale, design façade, and streetscape of the North residential building, hinting that things aren’t quire right, but failing to make any recommendation regarding the height of the center portion, that issue being important to nearby neighbors. The resolution holds open the possibility that this use-driven issue (mandated by 33 affordable housing units in the structure) could be addressed later in the process. 8th and D Residential and 7th and Pennsylvania Office Buildings. The residential building at 8th and D Streets “does not reflect the character of the neighborhood.” It’s “too blocky” and “too tall.” And it needs to be considered in connection with its partner facing Pennsylvania Avenue, the 7th andPennsylvania Avenue office building. The design of the latter, the resolution states “does not meet the demands of such a promising location.” The resolution says, “[a]n absolute reduction in height is essential” – and recommends reducing the 106 foot high roofline by ten feet. Further, it calls for reconsideration of the scale, height, and façade of both the buildings. 7th Street Mixed Use Building. The resolution states more work is needed – especially in the façade design. The resolution recommends that the developer 1) reduce the massing and height of the overall development by placing the mechanical rooms underground or inside the building, 2) expand underground retail, and 3) requests the developer to provide a three dimensional site contextual model for the project. Nearby residents wanted language requiring usage to include services to children and barring retail from the 8th Street residential building. Both of these proposals were defeated on procedural grounds that this resolution for the HPRB was not the appropriate vehicle for them. Overall, most efforts to weaken the resolution were unsuccessful. One effort to weaken it was successful – an amendment by Commissioner Garrison – removed language meant to address the height of the 7th Street façade. Some commissioners, who supported resolution language addressing the issue, voted for Garrison’s motion to strike the language, apparently in the belief that this would help move the Commission toward unanimous adoption of the measure. The motion to strike was agreed to, only to have Garrison and his two voting companions oppose the resolution on final passage. Consequently, the resolution does not address the issue of height on 7th Street which a 2009 ANC6B vote limited to no more than 50 feet. In the end, the resolution passed on 6-3 vote, with ANC6B Chair Glick, and Commissioners Campbell, Frishberg, Pate, Flahaven, and Critchfield voting for it. Commissioners Garrison, Oldenburg, and Metzger voted no. In a long and sometimes contentious meeting last night at Brent Elementary school, ANC 6B voted 6-3 to pass a lengthy document communicating its recommendations on the Hine project to the Historic Preservation Review Board. 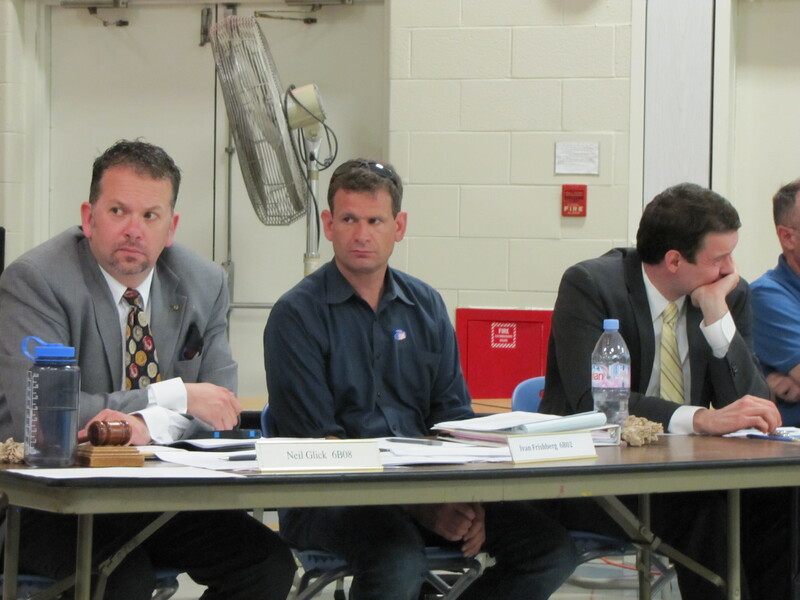 The Board will meet to review the project tomorrow (Thursday, April 28). Voting against the resolution were Commissioners Garrison, Oldenburg, and Metzger. Voting for the Resolution: ANC6b Chair Glick, Commissioners Campbell, Frishberg, Pate, Critchfield and Flahaven. The result and lack of unanimity came as a bitter disappointment to several Commissioners who had worked to forge a document which they hoped would receive the support of the entire commission. One Commissioner, Ivan Frishberg, expressed his dismay that he had spent three hours with Garrison, Oldenburg, and Metzger on Easter Sunday attempting to assuage their concerns and produce a workable compromise. A commissioner noted that a draft of the entire resolution had been out there for ten days, and noted that Commissioner Oldenburg had only submitted written comments 12 hours ago. Commissioner Brian Pate also expressed his disappointment, noting the amount of effort that had gone into attempting to reach a compromise, and the Commission’s success at “staving off inappropriate amendments.” Other Commissioners proposed amendments that did not pass, like Francis Campbell, but they nevertheless voted for the final product. Campbell said the project was too big and needs to go back to the drawing board for more refinement and he was not happy in any “way, shape, or form” with the project. The minority voting bloc engineered many changes to the document and met with success on more than half of the amendments they offered, but nevertheless they decided vote against it in the end. Garrison, in contrast, said though the resolution had been improved, “in the end, there are still aspects in the resolution I do not agree with.” Metzger said the resolution had not been changed to the point where he could support it. Oldenburg, who had offered the greatest number of successful amendments said, “the resolution doesn’t represent what my constituents tell me,” and declared her opposition to it. Many of her amendments seemed to be favorable to the developer, or – as she admitted – were “cribbed from the Restoration Society recommendation.” It was not otherwise clear which constituents she was referring to. As a result, last night’s lengthy meeting thus resulted in what was in many ways a watered down document which still will not be presented to the city with the authority of a unanimous ANC vote. Friday afternoon, the staff of the Historical Preservation Office (HPO) posted its report and recommendation to the Historic Preservation Review Board (HPRB) on the Hine Project. The report amounted to a tepid endorsement of the project. As such it is at odds or with the four community organizations most involved and affected by the development: EMMCA, Eyes on Hine (EOH), CHRSand a group of 8th Street residents. The developer, Stanton-Eastbanc, is represented by architect Amy Weinstein and seeks conceptual design approval by the HPRB for the Hine Project. Weinstein is a former member of the HPRB (a board of that is informed by, but not beholden to, the HPO staff). The HPO report provided details which have not been obvious to community members trying to analyze the drawings provided by the developer. For example, the report lists the maximum heights of the buildings as follows: North Residential Building, 48 feet; 8th Street Residential Building, 35 to 48 feet; 8th and D Corner Building, 63 feet; Pennsylvania Avenue Office Building, 88 feet; and the Plaza Residential Building, 58 feet. The report evaluates the project regarding three critical elements: the site plan, the general architectural direction, and the overall height and massing. The report finds the conceptual site plan is consistent with established patterns in the Capitol Hill Historic District. This finding is at odds with the public statements of the aforementioned community groups as well as the DRAFT ANC6b statement on Hine. It does recommend the architectural direction of the North residential Building be reconsidered, questioning the whether the central core of the building is an appropriate design model. As for other components to the project, the report states only that “implying depth and providing shadow to the skin of the 8th and D Corner Building will be particularly important for this design,” and notes that the 7th Street elevation remains too preliminary to comment on. The report finds that the overall height and massing of the 8th Street residential building is compatible with the surrounding residential blocks. Although thePennsylvaniaAvenueOfficeBuilding will be the tallest building on the Avenue, that “doesn’t necessarily mean that it will be incompatible with the Historic District …additional height in this location is not inappropriate” provided certain refinements be adopted. Among these, the report recommends setting the top floor back from the façade plane, eliminating the vertical masonry projection on Pennsylvania Avenue, and scaling down the height of the ground level storefronts. Overall, the staff report recommends approval of the general site plan, approval of the general architectural direction, each with further study in the areas noted above. The report recommends the approval of the height and massing for the various buildings, with further study of the Pennsylvania Avenue Office Building and the penthouses. It is unclear what weight the HPRB will give to the HPO staff report, and whether and to what extent the views of the various community groups will be considered by the Board when it meets next Thursday. Following is a list of standards the Historic Preservation Office (HPO) applies to new construction in a historic district to determine if it is compatible with the character of the neighborhood. EMMCA is preparing a statement on the Hine project for presentation to ANC6b and the Historic Preservation Board. emmcablog.org is requesting feedback from the broader Capitol Hill community in comments to this posting regarding the pros and cons of the Hine development. To view the full PowerPoint presentation by Stanton-Eastbanc, visit http://hineschool.com/sites/default/files/2011-03-02%20%20Community%20Presentation.pdf.